Randolph Alles is one of several Department of Homeland Security (DHS) officials being ousted on Monday, says the BBC's US affiliate, CBS News. Press secretary Sarah Sanders said in a statement: "Randolph 'Tex' Alles has done a great job at the agency over the last two years, and the President is thankful for his over 40 years of service to the country." Also on Monday a US judge blocked the Trump administration's immigration policy of returning asylum seekers to Mexico while they wait for their cases to be heard. Mr Trump recently withdrew his nomination of Ron Vitiello to lead Immigration and Customs Enforcement for similar reasons, saying he wanted to "go in a tougher direction". CBS reports that Mr Alles was asked to leave around 10 days ago - before a 30 March incident where a Chinese woman carrying a malware device allegedly lied to access Mr Trump's private Florida golf club, Mar-a-Lago. Senate Democratic leader Chuck Schumer on Monday called for Mr Alles to testify before Congress regarding "potential security vulnerabilities at Mar-a-Lago" in the wake of the woman's arrest. "Secret Service has done a fantastic job from day one," he said. "Very happy with them." However, the department's undersecretary, Claire Grady, should have been automatically appointed as acting secretary, as the senior Senate-confirmed official. Citizenship and Immigration Services Director Francis Cissna and Office of the General Counsel's John Mitnick are also reported to be on their way out. 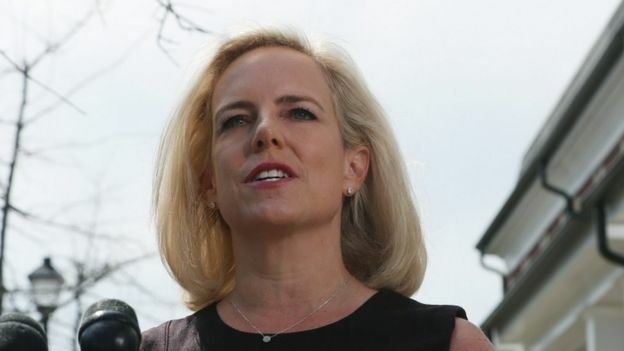 A DHS official described the shake-up to CNN as "a near-systematic purge", and said senior White House adviser Stephen Miller - known for his tough stance on immigration - was behind the push to replace the top levels of DHS with similarly hard-line officials.